95 per cent of the 941 apartments were sold in two and a half weeks in what is being regarded as one of the most successful sales campaigns in Australian history. Aurora Melbourne Central is UEM Sunrise’s inaugural development in Australia. The 3,197 square metre site is located within the Melbourne central business district at the intersection of La Trobe Street and Swanston Street. described the project as one of the most successful in their 49 years of development and praised UEM Sunrise’s role in the project. The site currently houses a seven-storey car park and retail with demolition expected to commence in 2015. Aurora Melbourne Central will be the only residential development in the city with an underground direct train connection to Melbourne Central station. According to Colliers International, its connectivity and accessibility is something that sets it apart from competitors and has contributed to its strong sales. It will further be enhanced with a direct underground pedestrian network and a series of overhead covered bridges linking the project with the Melbourne Central Shopping Centre, Emporium, Myer, and David Jones. They describe the tower as a vertical city complete with a hawker market, wine cellars, sky gardens, karaoke rooms, and a golf room. 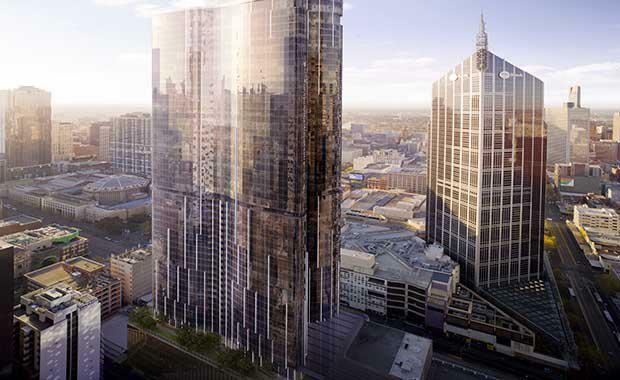 On completion, the tower will be one of the tallest buildings in the Melbourne central business district.